Stage star Laura Michelle Kelly, who won an Olivier Award for her role in Mary Poppins, is breaking out of the West End to launch a pop career. The 25-year-old singer and actress became one of Britain's brightest theatre talents after starring in Mary Poppins, My Fair Lady and Whistle Down the Wind. But she has put her stage career on hold to make intimate, impassioned pop music, which is likely to take her to a wider audience. Her debut album The Storm Inside sees her give classics including Paul Weller's You Do Something To Me and Nick Drake's River Man an intimate, easy-on-the-ear interpretation. She has co-written three new songs - including her standout single There Was A Time - with the likes of Guy Chambers, Jamie Cullum and The Divine Comedy's Neil Hannon. She has not turned her back on the theatre, she says - but is enjoying a change from the all-singing, all-dancing rigours of West End life. "Being in a studio and singing is almost like whispering into someone's ear," she says. "Being on stage is like presenting the whole package. I think there are benefits to both of those. "There are benefits to showing someone a world and getting them to believe in that world while they're sitting there. "And there's also benefits to singing into someone's ear and letting them imagine for themselves what I'm trying to say." If her album takes off, it will not be her first taste of pop stardom. Growing up on the Isle of Wight, she would sing Spice Girls and Robbie Williams hits to holidaying schoolchildren at teenage concerts. "They'd all be screaming," she says. "I was like 14 and they'd come and get our autographs like we were pop stars." 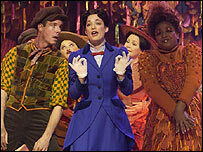 Kelly moved to London at 17 and got her big break as second understudy for the lead role in Beauty and the Beast. When the star of the show and her stand-in both fell ill, Kelly seized her chance, inviting 24 agents to come and watch her. Two turned up and both offered her contracts. After establishing herself as the darling of the West End over seven years, the change of direction "brought a lot of my demons out", she says. "I didn't even realise I had any. But suddenly I realised there was a lot of stuff in my life I needed to sort out, a lot of stuff I needed to start again. "In fact that's what There Was A Time was about, which was the second song I wrote - about being at a new stage in your life. "And so I'm really glad that's the first single because that's exactly what I want to say - I'm in a new chapter, there's so many painful things I'm going through but there's so much hope at the end." Guy Chambers, best-known for his work with Robbie Williams, helped her first serious attempts at songwriting. "Guy was so amazing at teaching me how to write," Kelly says. "And he also got me really excited about the different types of sound we could with my voice so he was the start of it really. "I couldn't write the whole of the album myself and in fact I probably wouldn't want to - it's a lot of pressure for your first album." The songs she has chosen to cover have helped her through "the difficult times in my life and happy times in my life", she says. You Do Something To Me and River Man have a deep resonance with Kelly - which is why she has picked them for the album. But she is not worried about putting off people who may see those songs as sacred. "Good songs should always be sung, they shouldn't be hidden," Kelly says. "They shouldn't be held back just because someone doesn't want to hear something different." Kate Bush's This Woman's Work was too special to tackle, Kelly says, and she cites Bush, Sting and Rufus Wainwright among her inspirations. Having already attracted strong media attention from the likes of BBC Radio 2 and Capital Radio, it may not take long before Kelly's own success stretches beyond the West End.